Tanya Kan reporting in: There’s been a lot of behind the scenes activity for Solace State! In the past 9 months, I’ve been focusing on a lot of very diverse moving pieces of work that I have not written about in a blog post yet. First of all, we have a new-ish trailer with new music by Robby Duguay, and lots of new in-game footage. The trailer is edited by yours truly. Don’t worry, the text will slow down to a pace that you’re comfortable with reading in the visual novel for the actual playable build itself. We’ve been expanding our team. CJ “Seage” Howlett have been working with us to create beautiful character art for Solace State! He has a fantastic fantasy and fashion arts background and he streams some of his art commissions online frequently on Twitch! 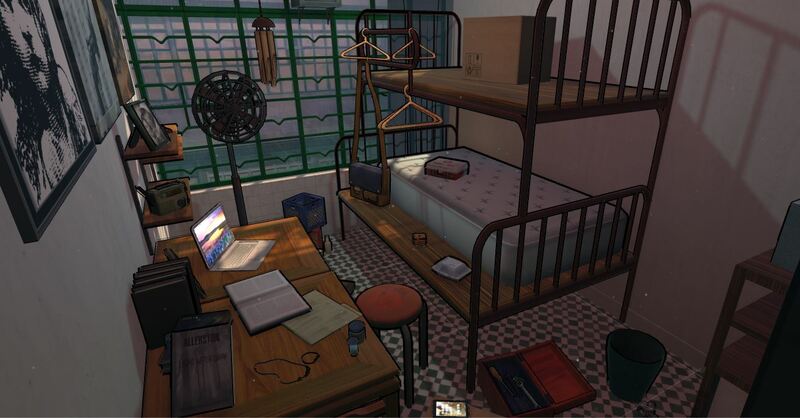 Another image from #solacestate that was released for #GDC. It’s pretty cool to see your work used in game, I must say! Hope you like it and hope you’re all having a wonderful weekend everyone! 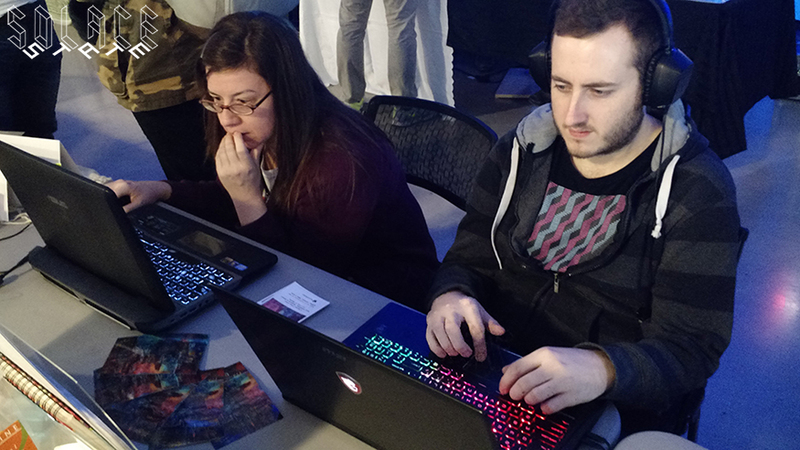 Here we are showcasing the game at Bit Bazaar at the CNE. I haven’t done a speaking engagement since the last half of 2017, but Sept 2017 onwards was very eventful. I spoke at two industry events at Toronto International Film Festival (DIALOGUES 2001: An Immersive Odyssey and CONNECTIONS New Technology & Immersive Storytelling) and connected with documentarians who are doing some incredible work and wish to dive into VR and interactive story-driven experiences. I took the opportunity to describe how politically complex and engaged work is as necessary as ever within even entertainment media. I also spoke at Make Change Conference on social impact games; A talk that I hope to polish – and with more than 3 hours of sleep before its delivery – and harness parts of it later on as well. I also showcased the game at Dames Making Games’ first ever Damage Camp. Finally, a small chapter demo of Solace State was selected as an official selection at the Regent Park Film Festival. The chapter was very well-received and I thoroughly enjoyed the programming at that festival! I have also been working on a lot of writing in November through January, and have grown in my confidence as a writer to develop a story of complexity that presents how difficult it can be for communities to protect each other’s livelihoods and bring about a more peaceable society. Silverstring Media are always a joy to work with. They have helped me wrestle with some of the hardest questions, including how to write about societal dramas, to how to stay productive and energized as a writer. I can’t wait to share more about my writing process as we get closer to launch, because the questions that the Silverstring team have engaged me with have been so substantial. I have also worked with Silverstring Media on Matt Makes Games’ and Noel Berry’s Celeste to offer narrative consultation on East Asian representation, and this was a most enjoyable and inspiring experience! At the same time, I have increased the amount of bizdev learning over the course of 2018, including attending an accelerated course at the Artscape Launchpad program and participating in Ryerson’s Transmedia Zone. Artscape Launchpad’s Creative Entrepreneur Program was fantastic in helping me reframe my mind around how to consider everything from the presentation of my business, to accounting, legal, marketing and grants. Launchpad brought in some great experts to walk artists through the process, and I highly recommend its classes and other events. Our cohort is fantastic and it’s great to learn from other artistic peers about their business directions. The whole experience has been very healing for me. Transmedia Zone also gave me resources about pitching and offers a huge library of business development resources, and in the future I have their mentorship program to look forward to as well. I have been working with an intern at the Zone and engaging her with directions on branding and social media as I learn the material myself. Bring that all together, I’ve been teaching myself more about social media use for branding, as well as taking advantage of my contacts in legal and accounting to ask questions to augment my learning. In turn, I have been getting more involved with consultation as an entrepreneurial artist, as well as engaging with community groups and legal thinkers to discuss about education and society. The community involvement helps ground my work as well, in a “bigger-picture” sense, and also helps me think outside of the box as a creative. For the month of February and March, the bizdev side has been my focus, and it does take a lot of energy out of me. Grants and finding sources of funding have also remained at the forefront the last several months. From April onwards, I will be refocusing on strategizing set hours around writing, while I work on a bit of design during other parts of the day. We aim to have a new build out later this year to share with you all! It was a joy to be interviewed by Lucy O’Brien, IGN Games & Entertainment Editor. We had a very reflexive conversation about some of the challenges that women face in the video game industry. What makes her piece stand out is that she examines deeply at our roots, our first spark of delight at finding game development as a viable path, to the systemic barriers, and finally to the actionable elements that can help us as an industry improve. Ms. O’Brien had interviewed 55 women and non-binary game developers from around the globe, and it’s extremely empowering to hear the stories that resonate with me. If there’s an equivalent to a palatial mural of our times on women’s experiences today in the games industry, this is that article. The no-girls allowed reputation around video games is further encouraged by years and years of mainstream advertising that has turned its back on the female gender (or sleazily revelled in its aesthetic). As video games continue to be primarily marketed towards boys and men, boys and men continue to primarily develop them. GDC17 was a great time, and I was happily surprised by the positive reception to Eviction Notice! Because of this, I want to share some of the core elements of design that drove me and the art direction that I pursued with this small-scale VR project. Eviction Notice’s design premise is very simple. It is primarily a linear narrative where voice-overs are triggered by gazing at objects around the room, which causes them to vanish. The story is about a young woman who is being forcefully evicted from her home for political reasons. So the overall feeling is that the space becomes more claustrophobic as it empties out, even as you examine artifacts that bring up feelings of nostalgia, whimsy and melancholy. Compared to some other interactive projects that I’ve created, the core design of the project remained the same today as it was from its outset. From the feedback the game received, it worked really well within the core strengths and technical limitations of the Oculus Gear VR (without controllers). 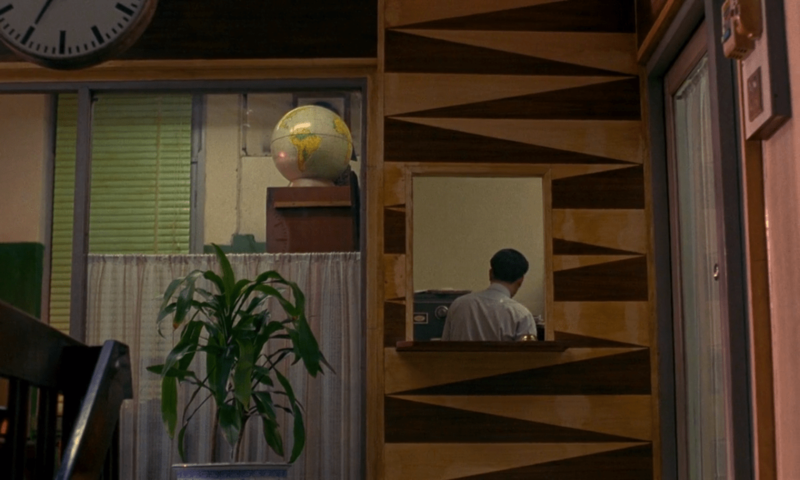 I went with an aesthetic that was developed from my other works associated with Vivid Foundry: Painterly, with colours like a more muted version of Wong Kar Wai’s films (In the Mood For Love, shown below). I wanted to create a sense of homeliness and of a fleeting moment in time (as sociopolitical impressions upon a person often are). Thus, the scene is set with a kind of smoggy, urban dusk. 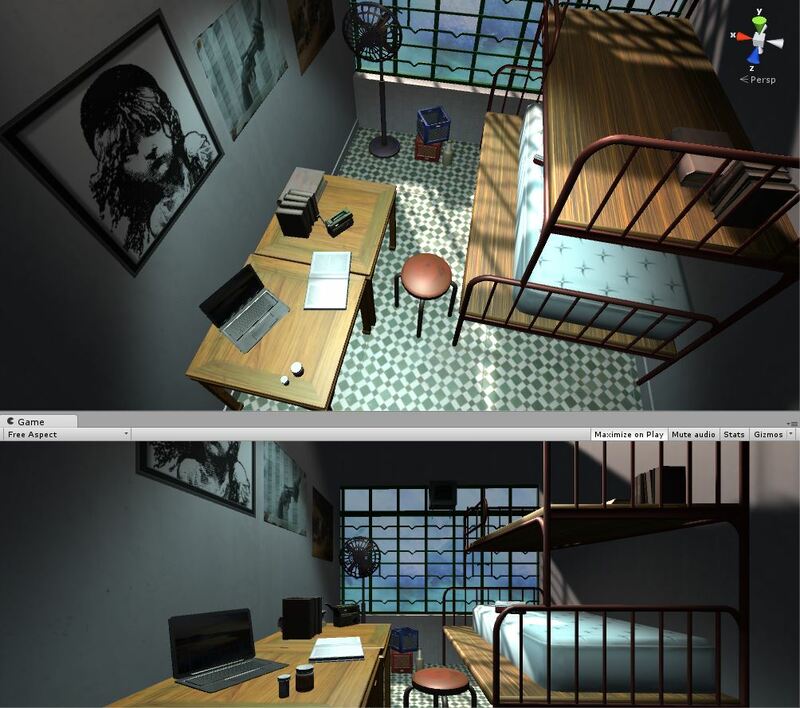 I’ve always loved setting up lighting, and creating colours in both raster textures and shaders in Engine. Because this was built for mobile VR, there’s a lot more limitations for post-production, but it was thus an interesting challenge adjust the look between modelling programs and Unity constantly. That’s the fun part of being the sole level builder, to really have the fine adjustments and control over the look of the game. Additionally, when I was travelling in East Asia in 2012, I spent some time with the Society for Community Organization, a non-profit organization for the life and dignity of those in poverty and an advocacy group for public and grassroots housing. I must’ve shipped back hundreds of dollars’ worth books from SOCO and overseas, many of which I offered to friends of the East Asian diaspora. 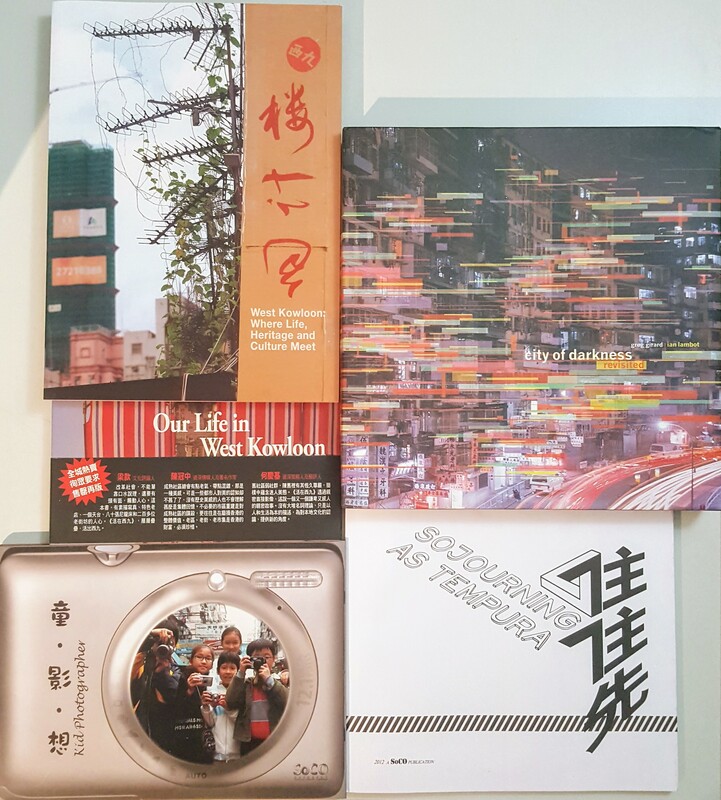 When reading their publications, I was struck by how the interior spaces photographed create deeply anthropological documentations to underprivileged groups, while simultaneously tell deeply personal, social stories about loss in family and community. I’ve also had the privilege of speaking to volunteers and locals there to discuss the plight of both the working poor and the shrinking middle class in East Asia, and the civil society ramifications of this. These themes thus embed inside my writing for the entirety of Eviction Notice. These were originally research for Solace State, but some of my writing, stories and inspirations that didn’t make it inside Solace State made its way to Eviction Notice. Thus, the two interactive experiences share very similar visual language as well. In many ways, Eviction Notice is suffused with “happiness within sadness”, while Solace State is about “sadness within happiness”. * I’ve also studied civic engagement for a good few years both during and after my academic career, and sought to create an accessible story that doesn’t take the political complexities for granted. It was in having conversations with people regarding their expectations of public policy and civil society that helped me bridge the gap between writing academically to writing for interactive narratives. It’s conversations about family histories, their hopes and fears for the future, and how they seek to protect the things that are most important to them. Thus, one of the biggest changes to the game from initial planning to its current iteration was actually the script. My friends Kwan and Jason offered the feedback that our early build with a voice-over soliloquy comes off as a lecture (which is only engaging if my politics are very similar to the viewer’s), as a cerebral experience rather than an emotive one. It led to one of my most important design changes, which was to implement an “I-spy” narrative framework to pick out the objects in a somewhat linear manner, with another voice in the room guiding the player. Following this, I’ve also had the privilege to work with Kaitlin Tremblay, whose narrative editing ensured that the dialogue is as evocative and natural as it can be. 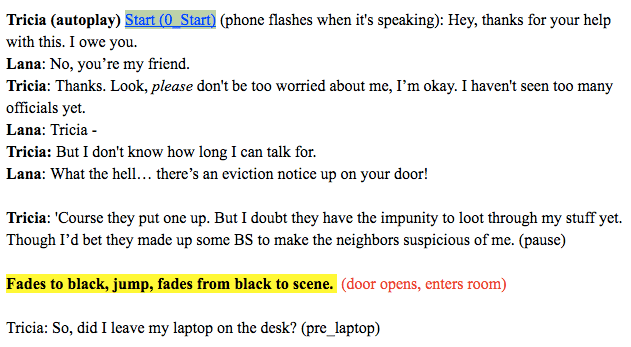 Afterwards, Chris Donnelly recorded Erika Szabo and I as the two characters whose voices now occupy Eviction Notice: Erika’s voice acting brought to life the owner of the flat, who is politically detained and fears for her possessions in her flat; My voice is that of her friend and the player character who helps her pack away her belongings. Eviction Notice has proven to be an interesting project for me to direct, design and develop because of its small scope, but still maximizing emotional impact through visual and narrative design. *Original quote about happiness/sadness attributed to Jungkook in a video behind-the-scenes about Run music video versus I Need U.
I’ve a delightful time speaking with Caty McCarthy, editor of Versions. 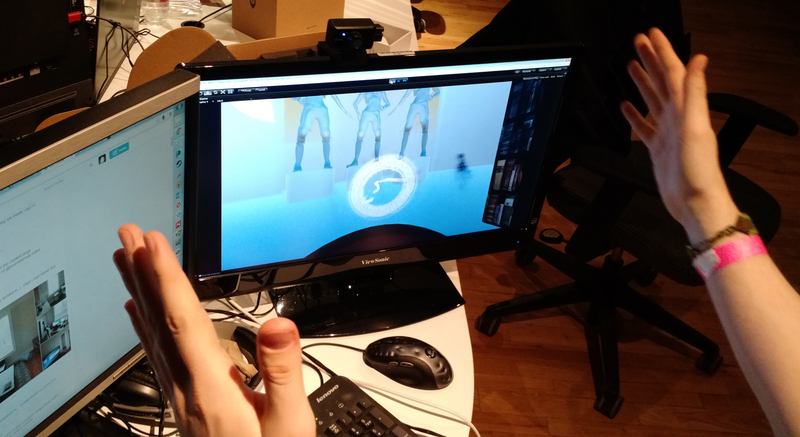 Versions focuses on AR/VR/MR development at Kill Screen, including experimental works! 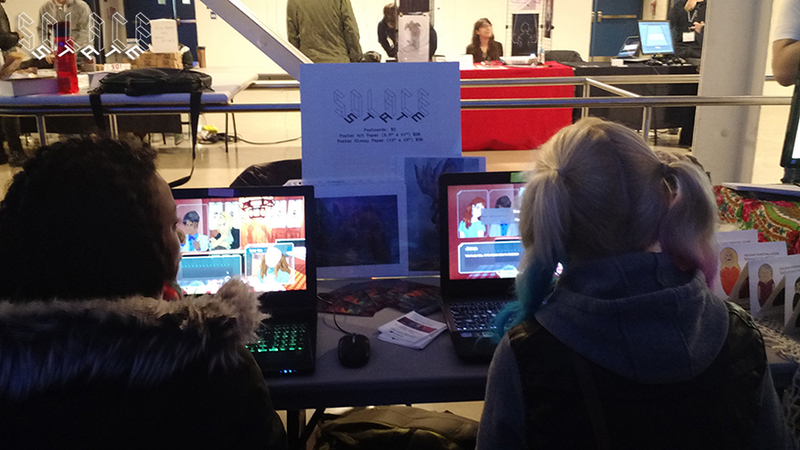 She asked me questions about collaborative development of Eviction Notice and how it went from game jam to its current iteration with a collaborative team, how it contrasts with my work on my 3D visual novel Solace State, and how we hope people will take away from it. 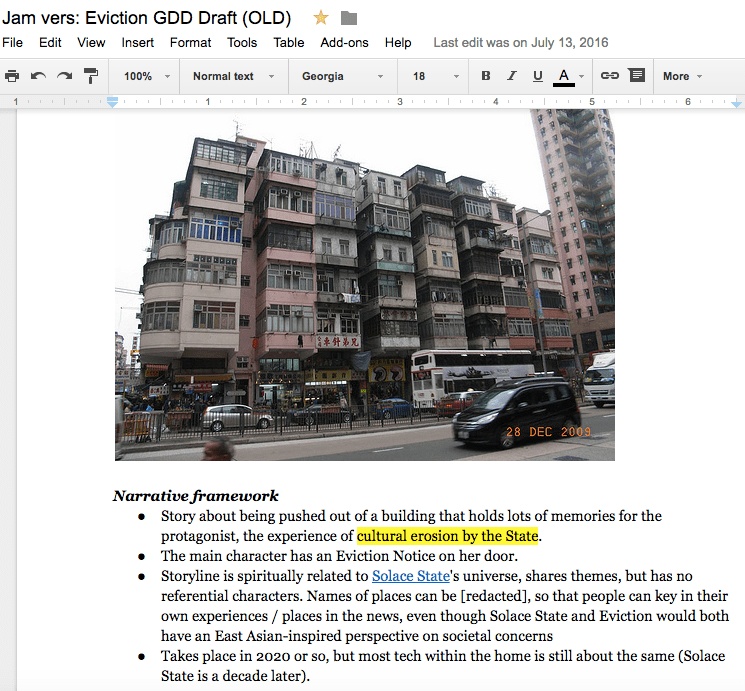 Eviction Notice is something that came up from a game jam in the Dames Making Games community in Toronto, and it only started in July 2016. So it’s a fairly recent game. Whereas Solace State precludes that by almost two years in terms of its ideation and its concept. I was doing quite a bit of research for Solace State, and it’s about civil rights, youth movements. I tried to find a very diasporic expression for it, something where from my own ethnic background I can compare and contrast it with the institution building in the west, for example through the Occupy Wall Street protests and so forth. From the research that I did and interviews I did with individuals who are activists or politicians, I also wanted to create a spin-off. A different tonality regarding civil rights, or the loss of culture in a slightly different format. For something like Solace State, I was very focused on breaking away from first person, so everything about that is going against the idea of configuring people in a kind of first-person-shooter experience. I wanted to disrupt that. I wanted to look at a city in a different way, from a different perspective. Eviction Notice, however, is fully into first-person because that’s part of that appeal. You want to be immersed in that environment. 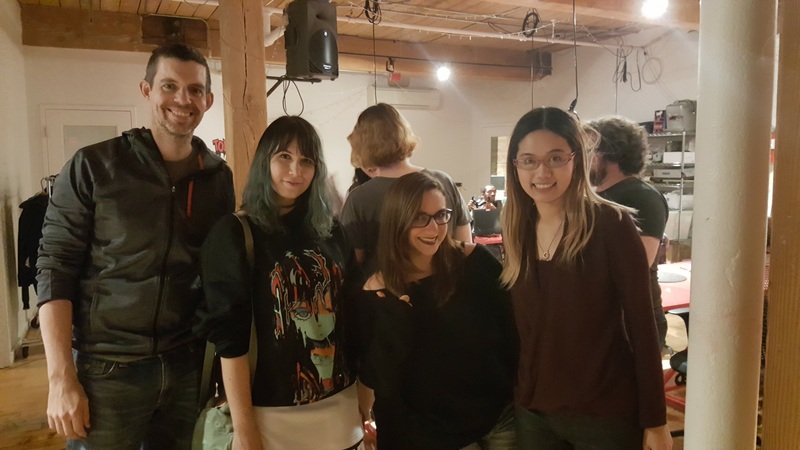 I had a great time on the evening of 2016-Nov-19 presenting to the wonderful community of Dames Making Games! I talked about my experiences so far developing Eviction Notice with the rest of my team. 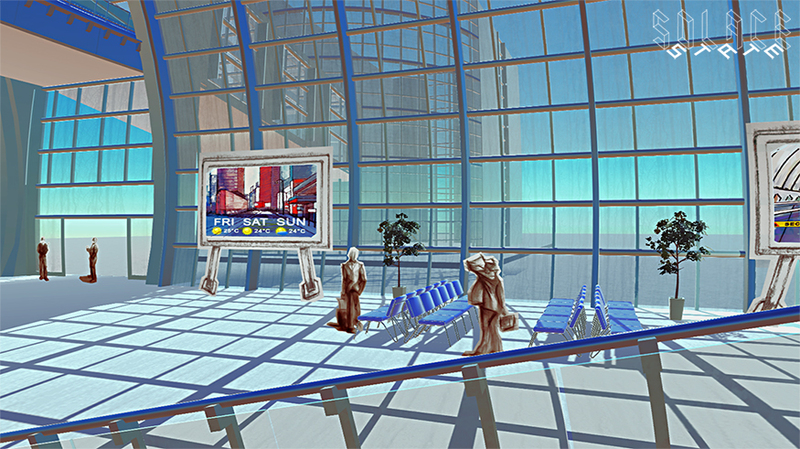 Eviction Notice VR is a game that first began in mid-July out of the Hyperreal Jam that Dames Making Games organized! I covered some challenges that we had developing for the Gear, especially focusing on art and production and narrative design. I also mentioned what worked well for us in terms of feedback structure and keeping everyone motivated. Thank you for such a warm reception and support from the community! Here are some Tweets and Instagram from the event.
. @vividfoundry showcasing Eviction Notice for the @damesmakinggames Speaker Social. 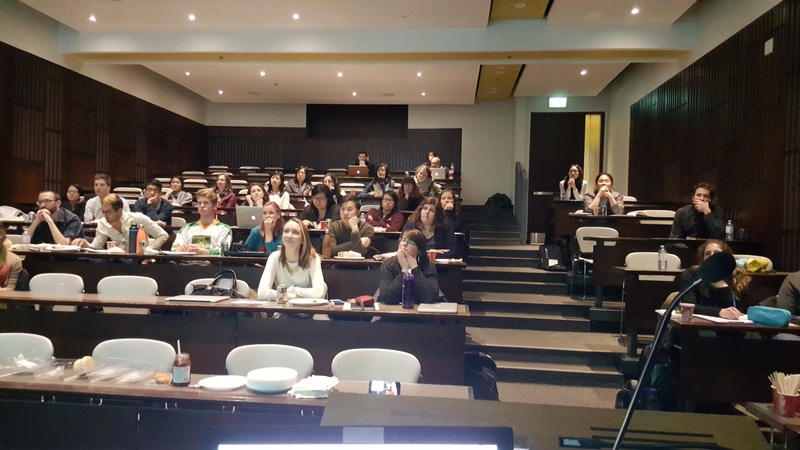 I had a great time presenting at U of T Biomedical Communications Alumni Association’s 10th annual Unconference on 2016-Nov-19! I presented a talk entitled “Designing for Narratives in VR and Visual Novels“. I talked about my modus operandi, and my method of designing from narrative-first then follow through with game mechanics, rather than the other way around. Along the way, I offered tips on how to hone in on a meaningful story, how to interview subjects to create great characters, and more. Doing a long-term indie project? It should have a thesis statement/moral core and be something you believe in. Thank you for inviting me, BMCAA! I am delighted that, since July 15, we’ve been working on Eviction Notice VR for the Samsung Gear. It’s something that we’ve contributed to whenever there is a moment outside of our regular work, and we have continually looked at ways that we can innovate on our way to tell a narrative story well. One of the major changes was in creating a new narrative, one that moved from monologue to a much more conversational story. The vision of the game was always to clear a home due to a forced eviction for political reasons, and the player can piece together the culture within which this character lived. People who played the previous build found that it was cerebral and intelligent, but didn’t engage with the emotions. And it’s a story about forced evictions and injustices that can definitely tug at the heartstrings and make people care. The script that I wrote, in contrast, felt more didactic, almost like a political speech. So, after hearing this feedback and listening to the concerns of the team, I decided to write it so that it was a cellphone conversation between two characters, and the player is helping her friend pack up everything. This gave a level of narrative immersion that really helped tell a better serious story. We also embedded some particle effects and visuals to make the space more interesting to look at. I think, in the future, the particles need to be designed better so that they all come from a similar style of art, so that you can really anticipate a uniform visual look. 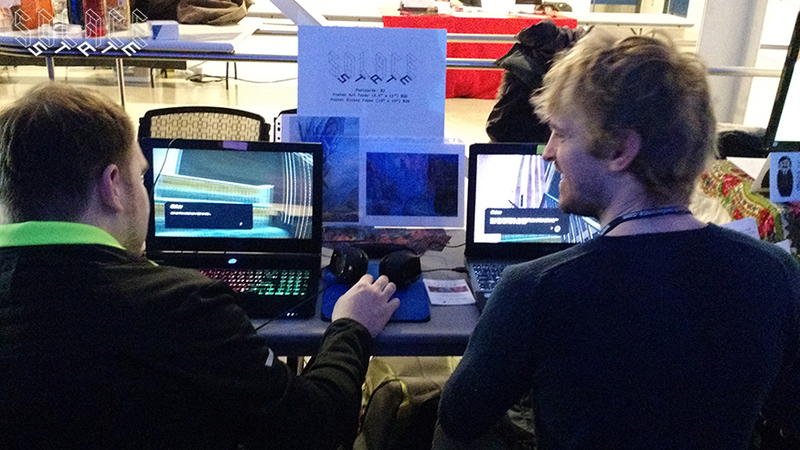 Yesterday we showcased our game for the first time at Akimbo Toronto Arts Show VR Showcase. One of the amazing piece of feedback we got from the showcase is that, the first time a player heard the voiceover react to something that she did in the game world (that is, looked at a laptop to put it away), it made her feel like the voice-over represented her actions and the gameplay felt that much more immersive. Another great piece of feedback we recieved is that the soundscape gave an embodied sense of the enclosed interior. However, those who are unfamiliar with the VR medium did take a while to get used to the gameplay and the visual space. We’re still going to continue to explore innovations in game design and mechanics to hopefully make Eviction Notice VR that much more immersive. This is just one of the first steps for us to approach mobile VR storytelling! Also shout-outs to some incredible Dames in VR, female-led teams who are doing some incredibly artistic experiences in Rift VR. Nicole Del Medico, middle, is showcasing Never Forget: An Architecture of Memory, and Kim Koronya is showcasing Globes. 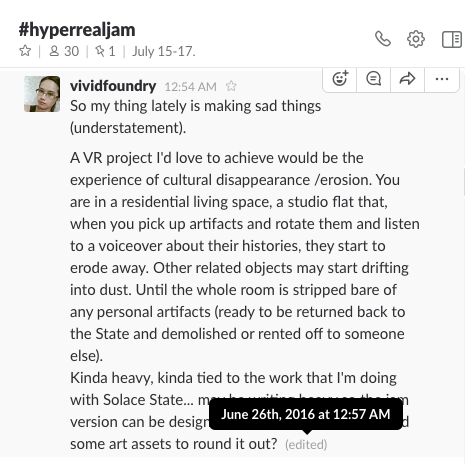 The #HyperRealVR Jam was one of the most fun and involved jams that I’ve ever had. And we are still working strong on our current game on the Gear VR: Eviction Notice. It’s hosted by Dames Making Games at Gamma Space, a community that I’ve known for years for being incredibly welcoming and warm. Right away, I feel at home, even though our newly formed team on Slack have never worked together before. There are some step learning curves for some members of our team that they tackled with grace, quick thinking and flexible adaptation. Chris Donnelly created some amazing voice-overs and ambient sounds, and helped scope down the project to hone in on the key lines of dialogue that our 3D objects are associated with. Kat Pavlov did an amazing job by creating a lot of assets within the 3D low-poly game arts pipeline for the first time, including a table, laptop, two pill bottles, florescent lights, first aid kit, radio, and takeout box (that’s 8 objects, you heard). Ksenia Eic breathed life into the game space with some very nice textures within a low-poly pipeline that is completely new to her too! Mic Fok made sure everything works with coding wizardry, linking sounds and interactive objects together, that the fading and highlighting shader works and works beautifully. And I did a bunch of 3D stuff like bunk beds and the room and textures, mentored the others on 3D modelling and texture work, did general quality control, level designed the room together in Unity, tried to make sure the narrative script made sense, and probably made rambling dad jokes. The assets we’ve managed to create within the time of the jam (recycling some walls etc. from Solace State). We did a bit of preparation work days before the jam. We knew going in that it would be a narrative and artistic experience focused on creating memories and feelings in the player, rather than a VR game about skill and gameplay. As such, because we only had two nights and three days to have a working game, we decided that it makes sense for me to do the narrative writing ahead of time to create a preliminary list of art assets that require 3D models. We had decided to have a fully custom modelled environment where you can interact with all the objects that your gaze lands upon. Once an object is active, the voice-over would tell a story about the memories behind that artifact. 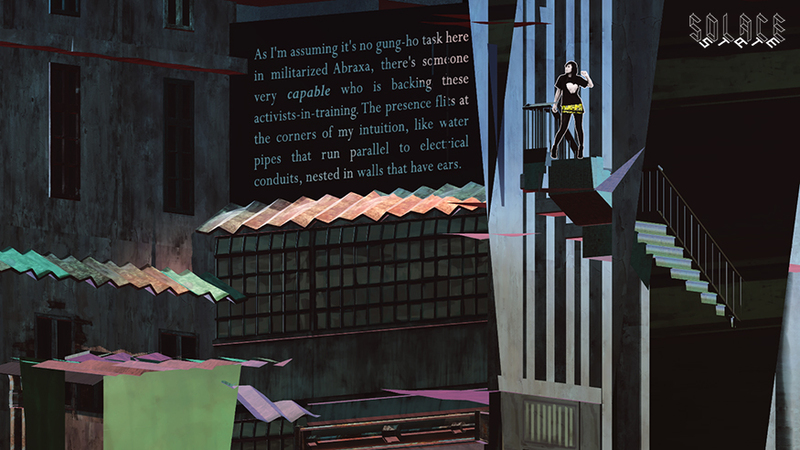 The game started from an idea about cultural disappearance due to a forced eviction. This small scope allowed us to focus on a small space that can still be ripe for exploration and lots of detailed objects. I wrote a story that drew from the idea of the disenfranchised classes and their lack of political opportunity in a city full of corruption. In this way, it ties itself thematically to my larger project, Solace State. 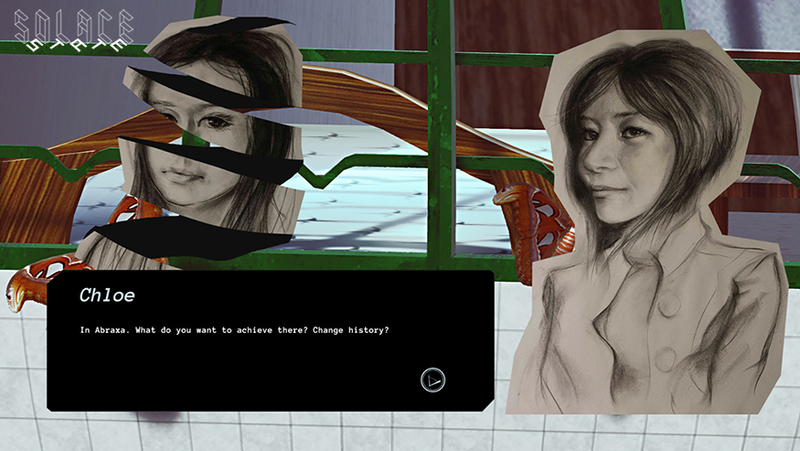 The game allows you to hear voiceovers of the protagonist as she picks up the items around her tiny flat, exploring shared communal memory across generations. 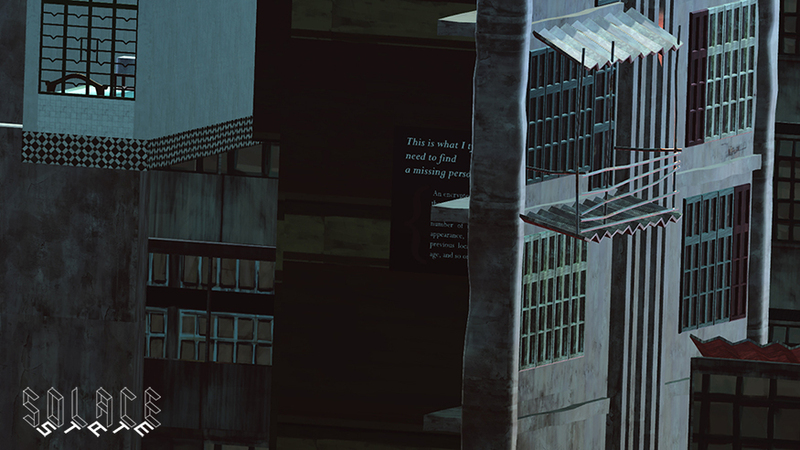 Adding different lighting and some new assets, including exterior building facades, outside window (Aug 13 update). This was a really adventurous project because none of us have worked with the Samsung Oculus Gear VR on Android before. I have never developed for mobile, although I have some experience with the Oculus Rift DK1 and DK2. Thankfully, with Mic Fok’s familiarity with programming for Android, we created a level that demonstrated our main mechanics and feeling of the game at the jam. I also insisted on a low-poly pipeline because, at the time, we weren’t certain what hardware limitations we may be running into. This proved to be very helpful, as all of the art assets we created during the jam can be used again with baked lighting instead of realtime lighting, the latter which was much too heavy to perform for VR on the Note 5. As of the second week of August, 2016, we are currently working hard on adding more presence to the experience. Right now, as you complete interaction with the artifacts, they fade away, until you are left with an empty room. We are adding more features that activate more interactivity through the gaze in VR, to make the experience more dynamic. Although all of the story has been written and recorded, we are adding more 3D assets that associate with those voiceovers.